You can enjoy a stuffed and roasted turkey breast for a feast or any time of year. When you don't want the whole bird, this is a great option. You can find fresh or frozen bone-in turkey breasts at the market. As opposed to a boneless turkey breast, you will be able to stuff this as you would a whole bird. You'll have plenty of meat for a large meal or enough for a week's worth of sandwiches. Thaw the turkey if it's frozen. This takes two to three days in the refrigerator and it is the preferred thawing method for food safety. Brining can season your turkey breast and keep the meat juicy, reducing the risk of getting dry turkey. However, this step will add an extra day. Prepare a turkey brine and place the turkey inside. Allow it to brine overnight in the refrigerator. When ready to cook the turkey, get out a large glass or metal roasting pan and set it aside. Rinse the turkey breast and then completely dry it using paper towels to absorb the excess liquid. This will help the butter adhere to the turkey. If you did not brine the turkey, at this point you can season the turkey with salt and inside and out. If you brined the turkey, season only with pepper as it can end up too salty if you add salt. Soften a stick of butter and add a tablespoon of thyme, oregano, and garlic powder to it. You may wish to use unsalted butter if you brined the turkey. Coat the turkey with the seasoned butter, making sure to spread the butter under the skin as well. Set the turkey breast opening side up and spoon stuffing into the cavity. Don't pack it in, just fill it full. If you have brined the breast, you won't need salt in your stuffing. Heat the oven to 350 F. Place the filled breast on its side in the pan. You can tie the breast together with kitchen twine or just leave it as is. Pour 1/2 cup to 1 cup chicken broth (use a low-sodium broth if you brined your turkey breast) into the pan along with celery, onion, and carrots, if desired. This will create a delicious base for making gravy. The chicken broth will help ensure the oven has enough moisture so the breast won't risk drying out. 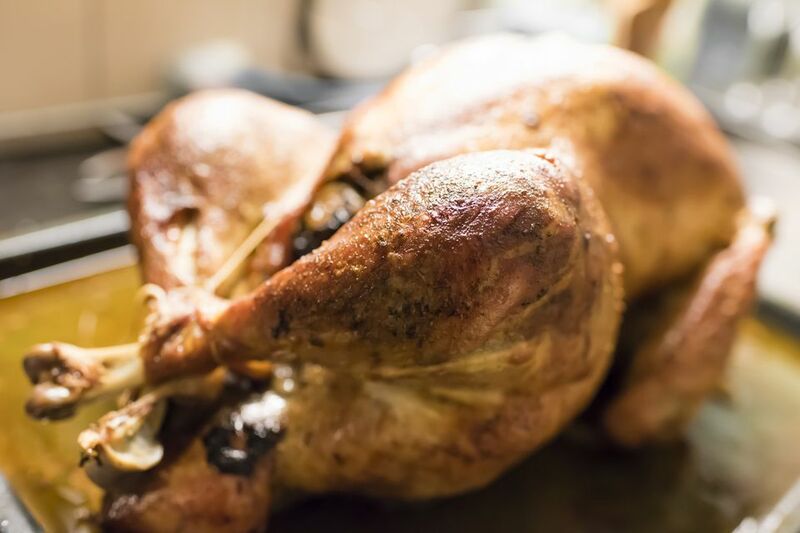 There will be a smaller amount of drippings produced by a turkey breast than a whole bird. Place the turkey breast in the preheated oven. Baste the bird several times during the roasting process. don't forget to baste the exposed stuffing as well so it doesn't dry out and keeps absorbing flavor. When a meat thermometer inserted into the thickest part of the breast registers 165 F the turkey breast is done. It should take 2 to 3 hours depending on the size of the turkey breast. Remove from the oven, cover with foil, and let stand 10 minutes. Use this time to finish the gravy and the potatoes. After the turkey breast has rested, carve it and serve it with gravy and your favorite sides.